*An English Travel Writer*: Jersey - mostly Wild. If you have been wondering why I haven't been commenting on blogs for a while, I've been on the island of Jersey, and just too darn busy, falling into bed tired out each night. I'm still researching this book about Gerald Durrell. Jersey is where he founded the Durrell Wildlife Preservation Trust and zoo. The Trust does lots of wonderful work abroad protecting highly endangered animals and, equally importantly, restoring their habitats. What's more, some particularly rare creatures have been returned to Jersey and bred in captivity, just to keep the species going. This is all part of a much larger and even more fascinating aim of re-creating ecosystems, in which every creature has a part to play - but more of that another time. 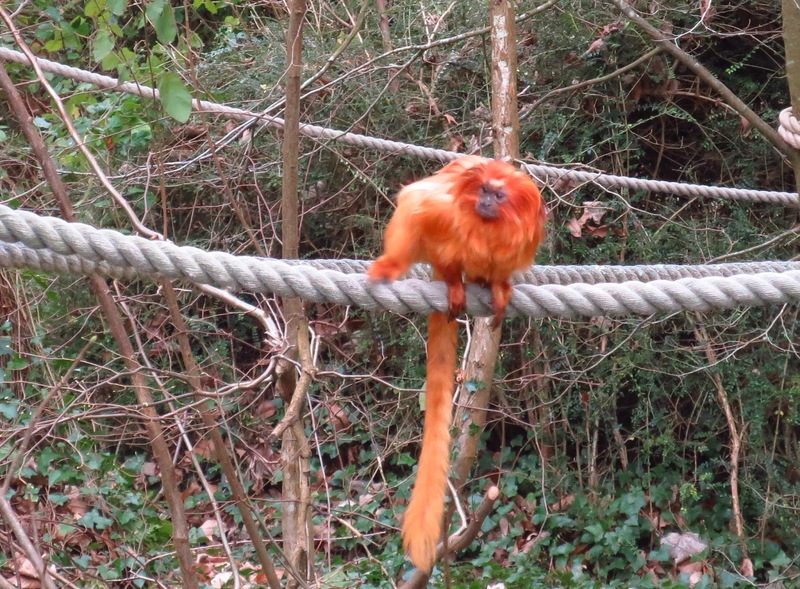 The zoo is a lovely landscaped wildlife park in the grounds of an ancient manor house, with lots of different types of enclosures designed for the creatures' wellbeing. It's highly specialised, keeping only rare animals, and so I thought you might like to see some of those that caught my eye. My favourite bird was probably the Palawan Peacock-Pheasant, polyplectron napoleonis. It is hard to convey how beautiful it is, its tail looks as if it was designed by William Morris and its feathers are deep blue iridescent and seem to shine in the dark. It lives only on an island off the Philippines and although it is supposed to be protected, a lot of its forest habitat is leased to loggers, and the birds are extremely threatened. I was intrigued by the bird below, even though it's not as rare as the peacock-pheasant. It's a hamerkop, from South Africa and Madagascar, and is the only member of its genus which has not become extinct. Personally I think it looks a bit prehistoric. Since it was a dark day and it was in a shady compound, I couldn't get a good picture, but this photo, from www.africanbirdclub.org will show you how odd it looks. As a result of its strange appearance, many people consider it uncanny, which protects a bit from being hunted in the wild. The zoo has an excellent reptile house, where I saw some of the rare creatures saved in Mauritius, most of them a little dull looking although it is crucially important to stress that they are every bit as important as more colourful creatures, because the whole of nature is a system in which everything has an important part to play. I liked this blue poison dart frog, Dendrobates azureus, (not from Mauritius I might say, but from Suriname.) Its secretions were once used by native hunters to tip their arrows, so the frogs are definitely "hands-off" for visitors. Their shiny skin looks somehow like beautifully glazed old ceramic, and it shone as the little creatures hopped around on bright green moss and explored fallen leaves on the ground. 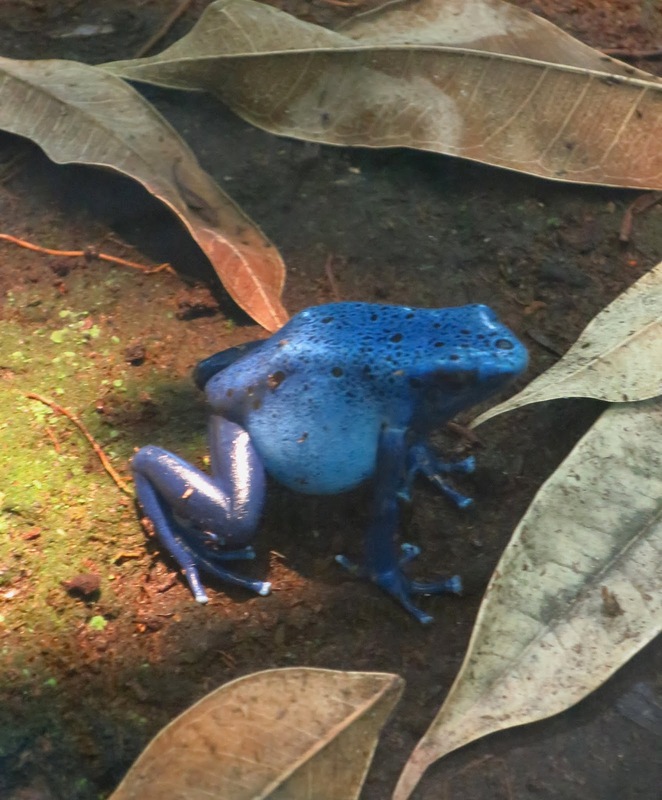 My photos are mainly blurred because the frogs leap very fast - below is obviously what is meant by "going a blue streak..."
And here was another, climbing a tree. 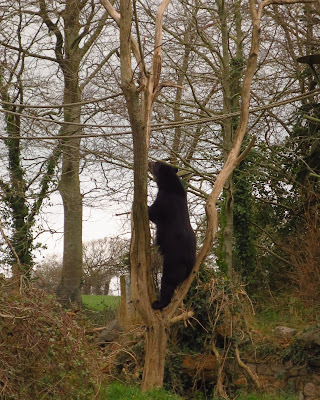 It had previously entertained me greatly by climbing up a supposedly bear-proof pole and destroying the little platform at the top with great blows of its claws, then sliding down the pole fireman-style, and strolling away nonchalantly. 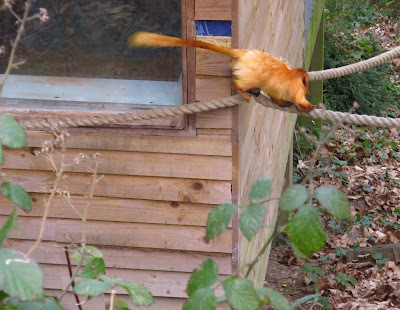 The Golden Lion Tamarins, who are highly endangered creatures from Brazil, also have thick and wonderful fur , but their is the most splendid, burning red-gold, like fire, and they leap around their forest home with grace and speed like flying sparks. 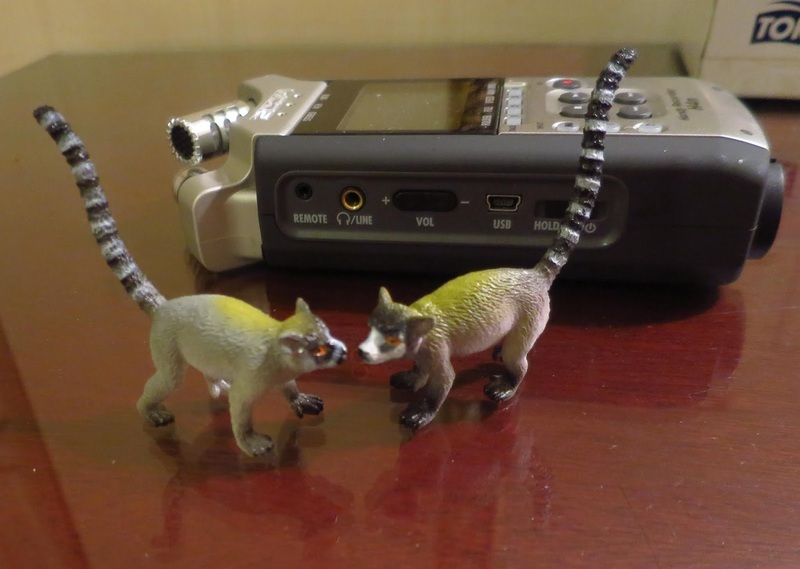 The ring tailed lemurs below are from Madagascar, one of many sorts of lemurs found there and nowhere else. 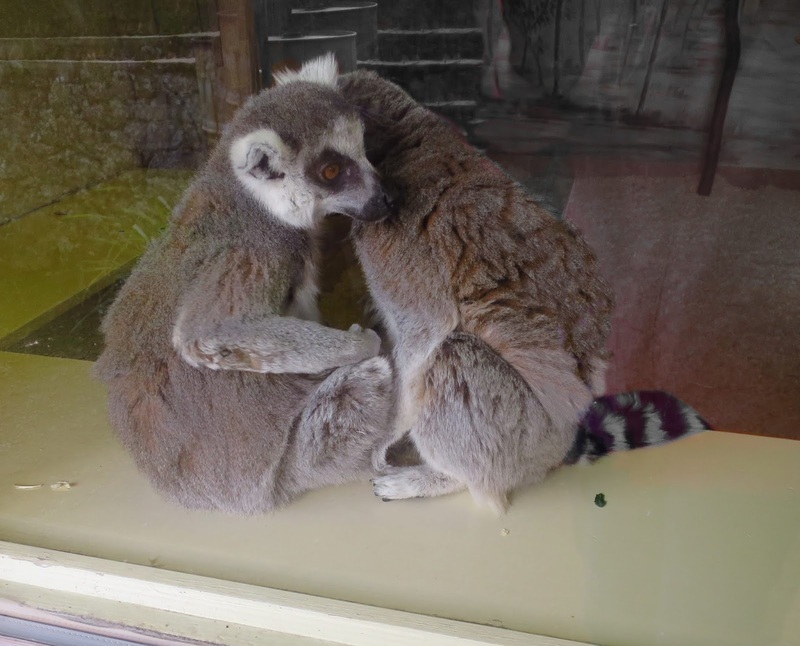 This pair has long, long stripy tails, and here they are grooming each other. 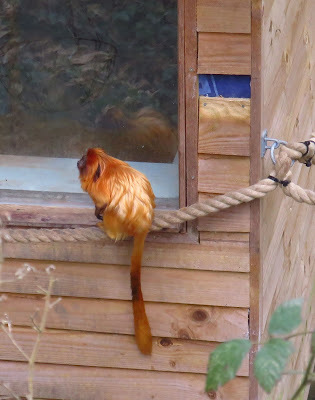 These delightful creatures like to sit in a window of their house in the sunshine when they are not swinging lightly and gracefully through the trees outside, using their extremely long tails for balance. I bought a couple in the gift shop for the twins - only plastic, though, and about an inch and a half long. Come to think of it, they are a rather odd colour, but I don't think the twins will either know or care. And here, finally are some Chilean flamingoes, who look as if they have just dressed up for the party of the year with elegantly dishevelled feathers ranging from brilliant orange to palest pink. I think those are red-breasted geese among them but I'm not sure. Whatever they are, they make a wonderful contrast. Normally I'd have made time to explore some more of Jersey. It's one of the islands in the English Channel, but it is much nearer France, in the sea between Normandy and Brittany. Jersey passed under English control in the 13th century, but is a Crown Dependency. and not part of the UK Most of the places there still have French names which my satnav wasn't too happy with at all! I was staying about half an hour drive from the zoo and was REALLY glad I had hired the smallest possible car because some of the roads (two way, with steep slopes and sharp bends) were tricky to navigate. Believe me you don't want to be grinding up this in first gear and only to meet a truck coming down! 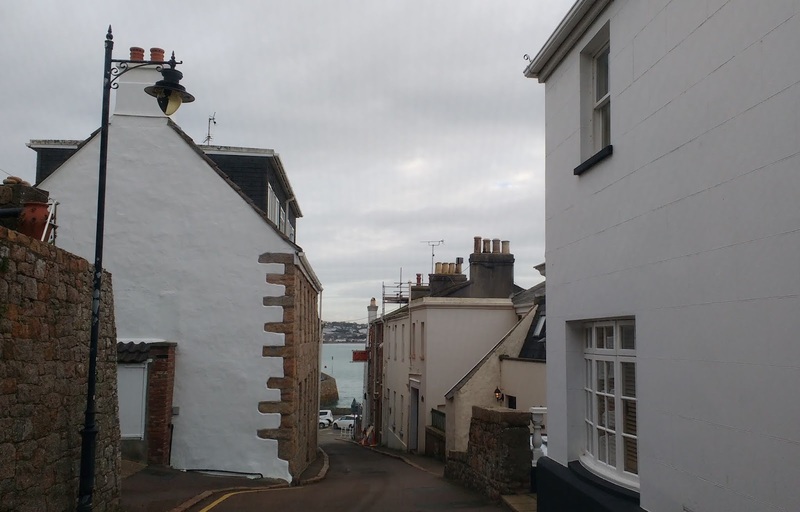 I've visited Jersey before and know it has some really quirky small attractions, including a house covered in mother-of-pearl shells, and a full time "sand wizard." But this time I spent all my time in the zoo...and I selling tickets at the front desk, I did meet a guy called Will Highfield, aka "Jersey Gorilla." 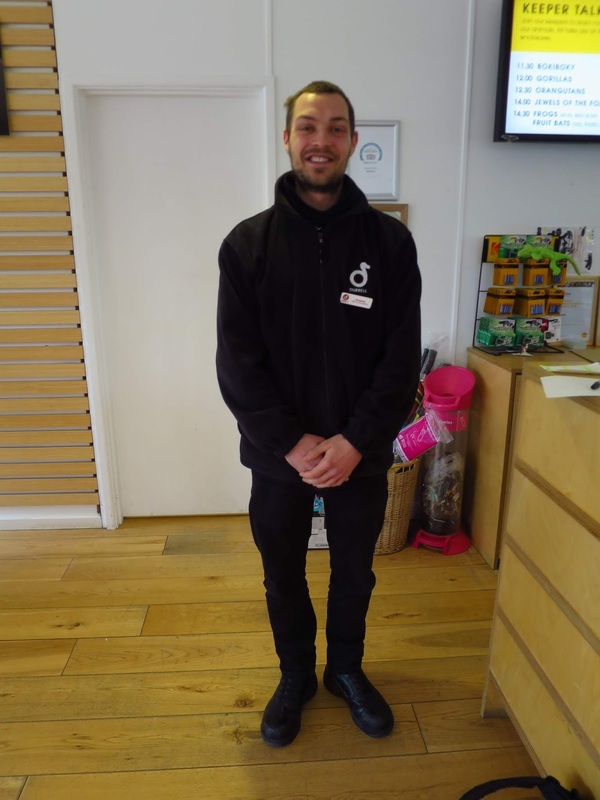 Although he works full time and volunteers a day a week looking after the zoo's gorillas, Will also does a lot of running and plans to run the Jersey Marathon in a gorilla suit in aid of a new gorilla house for the zoo. He's set up all kinds of publicity, ranging from giving free talks to local kids, to persuading local businesses to donate raffle prizes to support his fundraising, to doing fundraising quiz nights. What a dynamic guy. Who said one person can't do much? If you can access Facebook take a look here and see how he looks in his gorilla suit. I was glad I was staying in a nice hotel. It was called the Somerville and was really comfortable, a big old house on the hillside, with nice staff and a restaurant and bar with long windows overlooking the bay. It was a good place to relax after days of hard work and what was (to me) stressful driving. Now, I'm transcribing many hours of interviews, which will take me quite a while. I will be visiting blogs when I can, to see what you all have been doing. You never let us down; beautiful, insightful, important sites every week; beautiful photography. Great animals. The shots are not too close up, but the bear seems to resemble a North American black bear. And I think I would enjoy getting up a steep road in first gear. Those were the days. Thanks, Joanne. no, I didn't get TOO close to the bear even though it is (apparently) vegetarian. The worst thing about driving there was that many of the roads google directed me down, didn't look like roads to me. I'd drive past thinking they were a farm track and a small one at that. 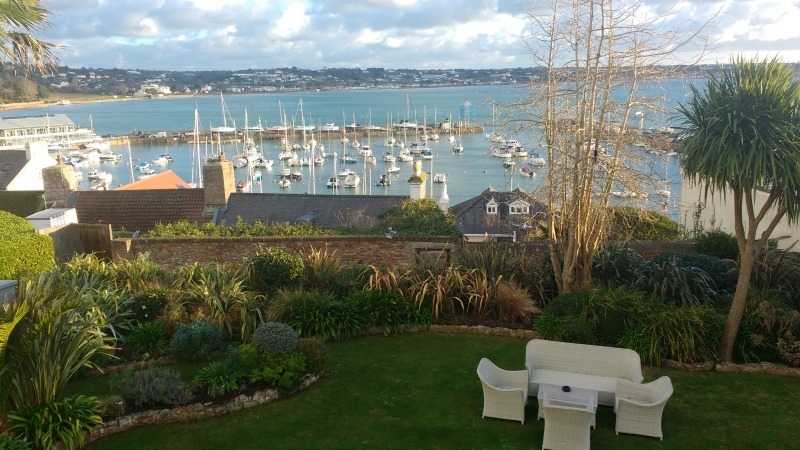 Your photo from the old house on the hillside, with long windows overlooking the bay, is gorgeous. 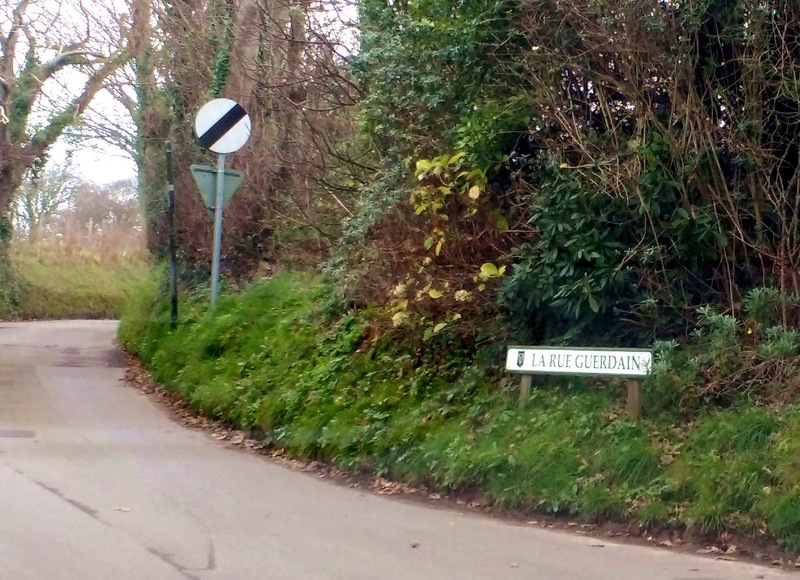 I have only visited the Channel Islands once (years ago) but I keep reading modern history and coming back to the subject in both lectures and blog posts. The best tour covered the Channel Islands and their defences, including the Jersey war tunnels, forts, underground Hospitals, towers and Liberation Square with its sculpture. What a great place to be a historically-minded tourist! I think everywhere in Britain is fascinating for the historically minded tourist - although Jersey is not exactly "in Britain" so its history has a particularly French tinge. I have started to find the preoccupation with WW2 a bit offputting. I still remember elderly relatives whose lived were ruined. One of them always refused to go into museums of the period, because, she said, it didn't deserve to be glorified. Hello Jenny, Sound like a fascinating place, doing good work. And the animals are so interesting! What I worry about is the attitude that we can kill off as many species as we like, breeding a few in places like this or even just keeping their DNA on file to replicate in the future. Nature is a huge interdependency, and destroying areas of habitat will eventually destroy the entire system. Very wise! it is a lovely place to walk. Last time I went was in summer and there are some great coastal walks. I am glad it has such happy memories. loved this post, Jenny. I had often wondered what Jersey was like; it was a toss up for us whether to go to Guernsey or Jersey, and Guernsey won - several times. The hamerkop certainly is an intriguing creature but I like it. It stands out from the other species. Well done you surviving the stressful driving. The photos are great as always and the zoo, including the Bear resistant pole that fails sound wonderful. Hopefully you get the peace required to sort out the notes and get some writing finished. What an interesting time you must have had. I hope the writing goes well. I hadn’t known that the there were any bears at all in South America. Nor did I. It was a strange looking bear with pale brown markings on its face, but very likeable and appealing somehow. I am so happy for you my precious friend Jenny that you are enjoying your time on such a beautiful island ! Wishing you a very happy prosperous new year filled with health peace and joy each step! Thank you dear Baili! I am glad that you enjoyed the post. I am so looking forward to reading your book! What a fantastic project! I am looking forward to reading it too but that means I have to finish it first, haha! I guess that is an incentive! I was fascinated by several of the creatures you highlighted. Oddly I've never had any desire to visit the Channel Islands but I'm beginning to have my interest tweaked. I would have thought they were your kind of place, although on reflection perhaps a bit crowded for you. It would be hard to leave such a zoo!! Thank you so much for the pictures!!! Wow! Yes, it was wonderful to see such dedication and energy! It all looks so lovely. I'm glad animal species are being bred and preserved. Is a dependency the same as a commonwealth? Best to you. No, I am not too sure of the definition of a dependency, I think it's a place largely governed by but not completely part of another country. An amazing place -- it's wonderful what someone who is determined to help can do. I always admire individuals who work to make a difference. I am so glad that you took my advice and that you are writing that book about Gerald Durrell! LOL! I can't wait until you finish your book, I will tell EVERYONE about it! LOVE your photo of the animals and I think that is great of the gorilla guy on Jersey. Take care! Yes, Kay, I am glad I took your advice too!And I hope you will enjoy it when it is finally finished. Yes, that gorilla guy was inspirational. I am always glad to see people taking the initiative in this way, I really admire that kind of thing. Jersey looks like a great place to visit, very pretty indeed. And what a Zoo - so many unusual animals and birds. Totally love the peacock-pheasant, and the blue frog which sounds absolutely lethal. Also the hammerkop bird, very strange indeed. You have been so busy, but I know the outcome will be great, Jenny. Thank you Patricia. I hope so too. 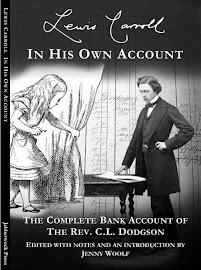 Right now I'm busy transcribing interviews, hours of them - which is why I haven't been so visible in blogland lately! Fascinating! I've never been to Jersey - though I have been on holiday to Guernsey - and didn't even know it had a zoo. Now, what is it about zoos? - what I know about animals could be written on a dog biscuit, but I do enjoy wandering round them. We should feature a couple over on ABAB. This one sounds particularly interesting - and obviously does some good work. Never heard of a hamerkop - agree, it does look prehistoric! Good luck with the project!! I have never been to Guernsey and to be honest I don't know much about the channel islands myself, although I've been told they're all quite different from one another. Yes, please do some zoos on ABAB! I think Chester is supposed to be a very interesting one. Oh Jenny, that zoo! Well, I have a big crush on lemurs and that last photo of the the flamingos and geese (how beautiful were they?!!) made me smile too. And the peacock pheasant. How close do they let you get? You must have a very good zoom. The view from the hotel looks great and it must have been very nice to return to this spot after your full day. Love the view, though it sounds like you paid big for it with stress just getting up the hill! And three cheers to the Jersey Gorilla! He sounds like quite a guy! I love lemurs too, Jeanie, they are so charming and usually so light and graceful hurling themselves around the trees like they do. 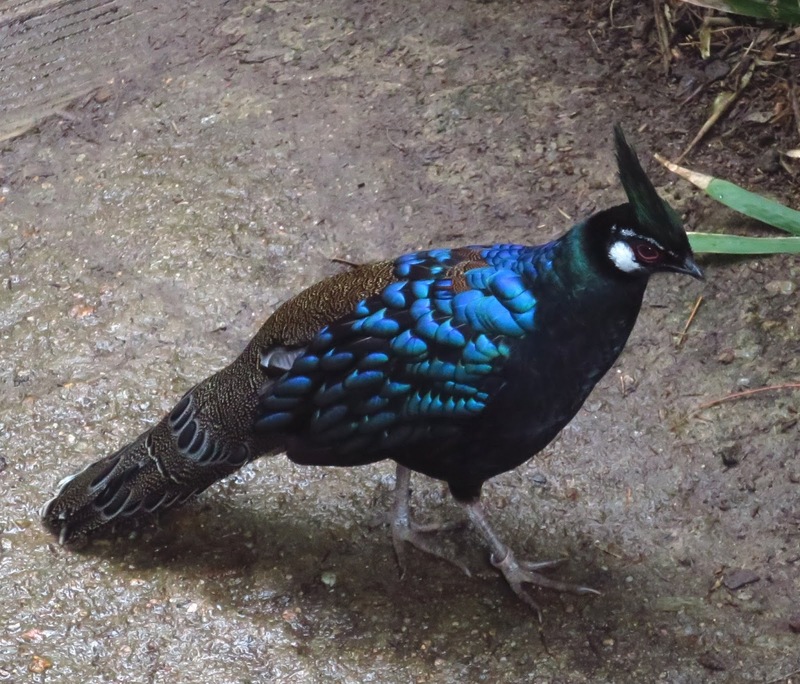 I got very close to the peacock pheasant, I suppose that being in a zoo it was fairly tame. Or else they just haven't evolved to be scared of mammals, like some of the endemic birds on Mauritius. Oh, my goodness, Jenny! How wonderful all of this is. The animals you've shown here are absolutely marvellous...fabulous photos. What wonderful creatures they all are...and we MUST protect them. They are precious and of so much importance. If only some among we humans realised that! when completed, will benefit and give joy to many. Yes, the more I find out about the subject, Lee, the more I want to protect the environment. It's not just animals either - it's such an amazing complex web where everything has a role. It's made me feel rather shocked at how ready the human race has been to destroy it, and still is. I can't imagine running a marathon in a gorilla suit. Actually, I can't imagine running a marathon. Have just been on a tour of New Zealand, which has lots of rare birds, animals and plants that conservationists are trying to protect - the Maui Dolphin, the Chesterfield Skink and the Mokohinau Stag Beetle to name a few. Good to know Jersey is playing its part in trying to save endangered species. The Jersey Gorilla is quite a guy, as you say. He puts less energetic souls such as myself to shame! I was told that New Zealand has some terrific expertise. When I was there I watched a baby kiwi being hatched and learned all about the huge threat to them by stoats, of all things. I always thought of stoats as pretty harmless but that's what happens when you don't have any predators. I would love to go back and see some more of it, at the time I wasn't particularly into the subject but just lucked out knowing someone who would take me to the bird breeding place. What an impressive array of exotic creatures! It must take an incredible amount of work to properly care for them. I've never heard of a Peacock-Pheasant, but it's beautiful. And those Golden Lion Tamarins are funny! Good luck with the research for your book. Research is always enjoyable but can be extremely exhausting! Good luck with the transcribing - hope you can come for air from time to time, look at your lovely photos and know it is all worth it! Oh yes, it is worth it, but I am glad to be getting towards the end of the transcribing! Such an interesting and enjoyable posting, as ever. The birds could well have been made by the Martin brothers, especially the Hamerkop. I will have to look up the Martin brothers now, I thought they did huge paintings and one of them tried to burn down York Minster. The Hamerkop does look a little creepy but that is part of its charm for me. Wonderful! I have not seen a hamerkop. Is it standing in the river to catch a fish? It reminds me of a shoebill I posted last year. Happy Sunday to you. I had not seen one either. 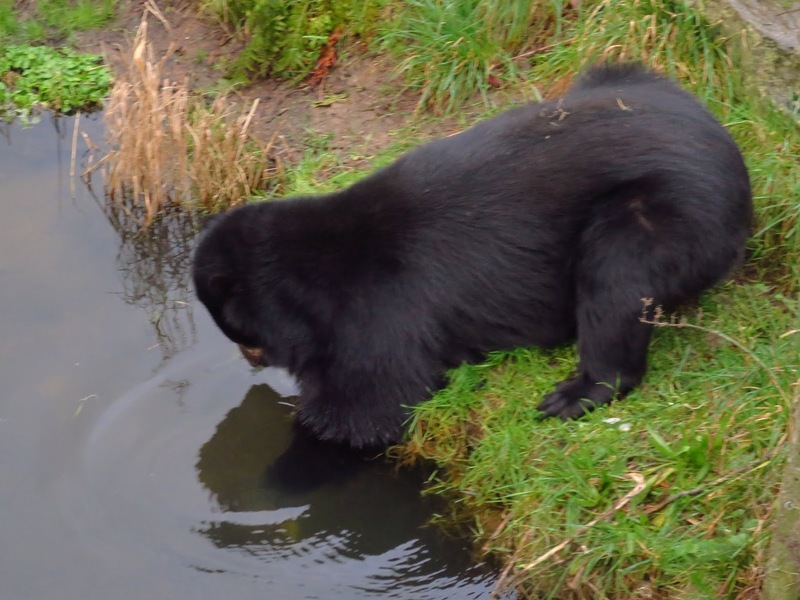 It likes to stand in water and I suppose it was hoping to catch a fish. I haven't ever seen a shoebill close up, although I have seen them at a distance. thank you for your commment. "The Palawan Peacock-Pheasant, polyplectron napoleonis." is my favorite too. Hello, Jenny, I love visiting Zoo as well. I liked especially Palawan Peacock-Pheasant and ring tailed lemurs, they are so nice animals. I rememder there is a little zoo in the Kenwood park, Northern area of London where some lemurs live. I think your grand kids loved your souvenirs. Yes, the little zoo is really sweet, and all the kids around here like to go and see it in the summer. I don't think they have lemurs there though. Your post was a treat. I always wished to go to Jersey and Guernsey but have not yet. What an opportunity you had to observe these unique animals. The bird you showed, the hamerkop, is very strange looking – it looks as though its large heard has been added as an afterthought. The whole post was most interesting. Thank you. I am really glad you found the post interesting. 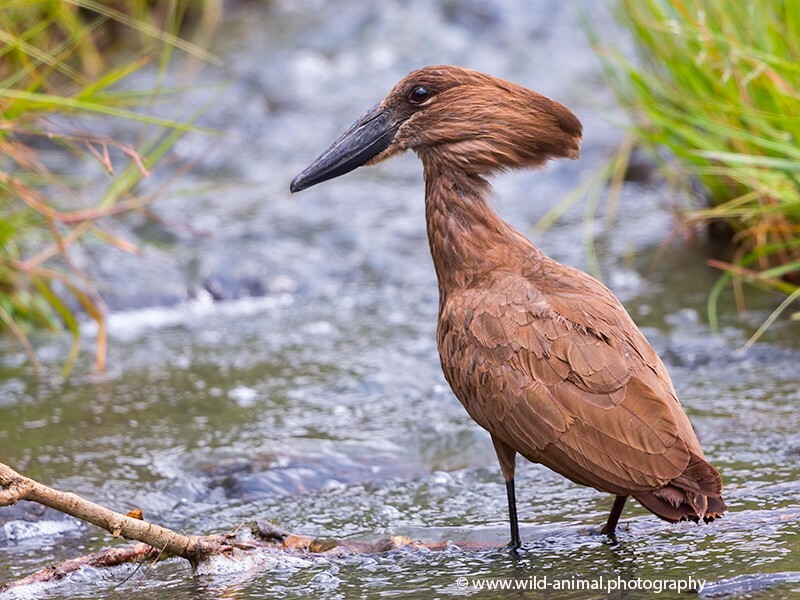 I agree that the hamerkop's head looks like an afterthought, to me it looks as if someone put a head of quite a different bird on its body, that didnt fit very well! To me that is part of its endearing charm, somehow. Jenny, I was a great Gerald Durrell admirer and am quite envious you met him. 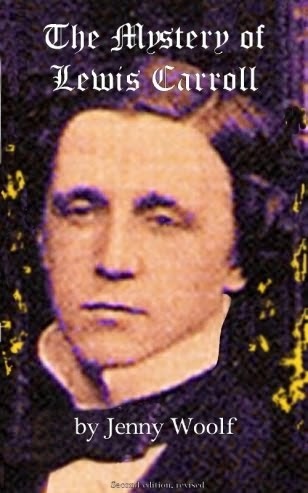 Do you know why he established his Zoo in Jersey? I know he collected animals from far and wide, but many of them will have come from hot climates. I've often wondered how he thought they would adapt to a northern European environment. They obviously do, and others have imported exotic animals before him, but I would love to know what his thoughts were on the 'rightness' of doing this. I don't claim any knowledge at all. I'm just curious as to what he thought and said. Your photos are lovely! Yes, Val, I think i know the answer to both those things. He originally planned to establish the zoo near Bournemouth, in Poole in fact, because his family lived there, but the local government officials procrastinated for years so when the chance of a suitable site in Jersey came up he had to take it. As for bringing the animals from dfferent climates, it is done to protect them, as, for instance when they are being hunted to extinction or their habitat can no longer support them in the wild. They always continue to belong in their own countries and the aim is to captive breed them so they can be returned home. Hesaid that his ambition was to close the zoo down because it wasnt needed anymore. Immense care is taken to give the animals conditions they can thrive and breed in, (and its fascinating to me to learn how this is by no means as easy as it looks : nature is so complicated). I meant to add that they would not keep any creature in conditions it could not tolerate. They also ensure every animal has what it needs for its health and comfort not to mention ability to survive in the wild. I missed this post because I was away in Costa Rica, but I am very glad that I caught up with it. I have a great deal of admiration for the Wildlife Trust; some of the work it has done is the stuff of legends, with characters like Carl Jones enbedded into the lore of wildlife restoration. I had the distinct pleasure of having the head of their bird department visit our Barn Swallow project two years ago. That is really interesting, David. Yes, the trust punches well above its weight, it is not that large. When you get your book finished be sure to let me know. I admire anyone who works on such worthwhile projects, making a real difference. I can imagine how tired you were at the end of the day. Glad you had a nice hotel for relaxing!